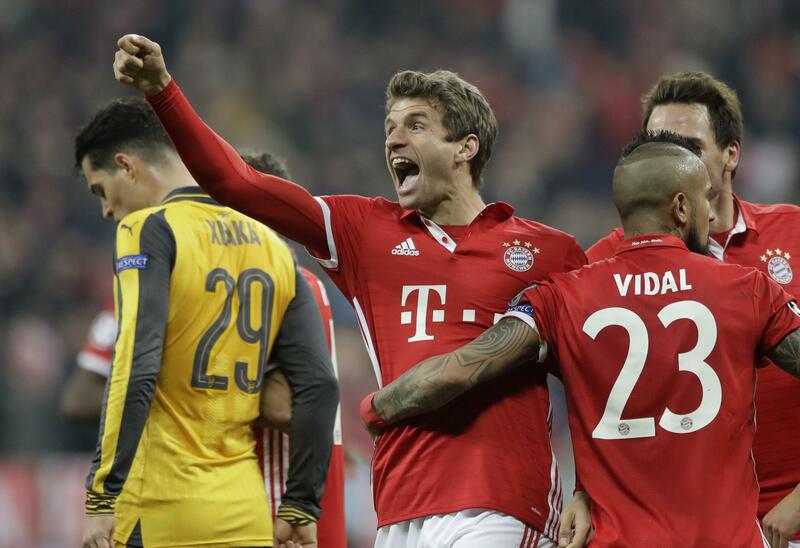 Wed., Feb. 15, 2017, 10:30 p.m.
MUNICH – Bayern Munich answered its critics with a comprehensive 5-1 rout of Arsenal in the first leg of their Champions League clash to move a step closer to the quarterfinals on Wednesday. Thiago Alcantara struck twice in a superb performance, and Arjen Robben, Robert Lewandowski and substitute Thomas Mueller scored the other goals. The return match is March 7, when Bayern will be a hot favorite to advance. Arsenal, which lost captain Laurent Koscielny to injury early in the second half, appears set to exit in the Round of 16 for the seventh season in a row. In the night’s other first-leg match, Real Madrid rallied from a goal down to beat Napoli 3-1 in Spain. Bayern extended its winning run at home in the competition to 16 games with a repeat of the score from the last time the sides met in November 2015. But Ancelotti will be relieved his side showed what it is capable of after five unconvincing games since the winter break, when Bayern faced criticism for looking tired and lacking the dominance it displayed at the start of the season. There was little Arsenal goalkeeper David Ospina could do to stop Robben from opening the scoring in the 11th minute. Given too much space, the Dutchman cut inside as he’s done so often before and let fly with a shot that went in off the underside of the bar. Bayern dominated, and it seemed only a matter of time before the home side would add to its tally. Instead, Arsenal was given a lifeline when Lewandowski took down central defender Koscielny and the referee awarded the penalty before the half-hour mark. Amid deafening whistles from the home fans, Manuel Neuer saved Alexis Sanchez’ weak spot kick. Sanchez missed the rebound, but cut the Bayern fans’ cheers short when he prodded in at the third attempt. Suddenly the momentum was with Arsenal. Granit Xhaka should have scored when he shot straight at Neuer, and Mesut Ozil might have made it 2-1 at the break, only for Neuer to come to Bayern’s rescue again. But it was all Bayern after Arsenal lost Koscielny in the 49th minute. Robben and Lahm combined on the right ring, the latter producing an inviting cross for Lewandowski to rise above two defenders and head inside the right post in the 53rd. The Poland striker produced a brilliant back-heeled flick to send Thiago through to score another three minutes later. Bayern had a host of other chances, first through Lewandowski, who struck the crossbar after rounding the `keeper, and then through Robben, who was blocked by Kieran Gibbs, illegally according to the Bayern players, who demanded a penalty. Published: Feb. 15, 2017, 10:30 p.m.